Four month ago, a massive data breach on the eBay website affected 145 million registered users worldwide after its database was compromised. Meanwhile, another critical vulnerability on the eBay website was reported, allowing an attacker to hijack millions of user accounts in bulk. An Egyptian security researcher ‘Yasser H. Ali’ informed The Hacker News about this vulnerability 4 months ago, which could be used by the cyber criminals in the targeted attacks. At that time, Mr.Yasser secretly demonstrated the vulnerability step-by-step to ‘The Hacker News’ team and we confirmed - IT WORKS. Since it was not addressed by the eBay security team, we kept the technical details of this vulnerability hidden from our readers. But, as we promised to share the technical details of this interesting flaw, once after eBay team patch it. So, Here we go! The vulnerability Yasser found could allow you to Reset Password of any eBay user account and that too without any user interaction or dependency. The only thing you required is the login email ID or username of the victim you want to hack. BUT HOW TO HACK ANY eBAY ACCOUNT? 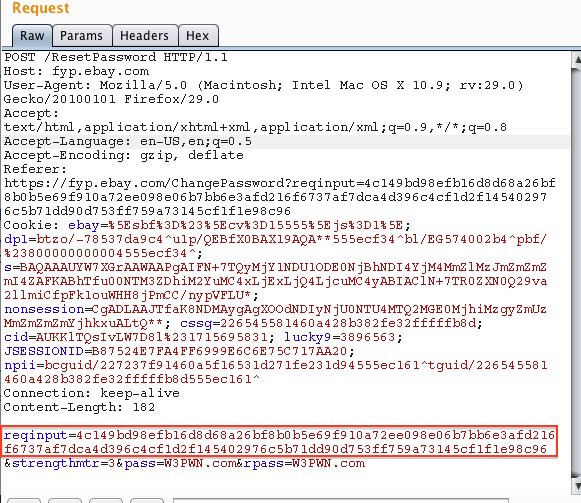 Basically to recover the forgotten password, user is first redirected to a password reset page, where eBay page first generates a random code value as HTML form parameter “reqinput”, which is visible to the attacker as well using Browser’s inspect element tool. After the user provides his/her email id and presses the submit button, eBay generates a second random code, which is unknown to anybody else except the users themselves, and send the code along with a password reset link to the eBay user with the registered email address. Once the user clicks on the password reset link provided in the email, user will be redirected to an eBay page with new password set option, where the user only needs to enter a new password twice and has to submit it, in order to reset his eBay account password. As Proof-of-Concept, the researcher targeted one of our team members’ temporary account with email address info@thehackernews.com. First he made a password reset request at eBay for the targeted email ID and saved the generated ‘reqinput’ value from the inspect element. Then he directly crafted a new HTTP request to the eBay server at password reset form action with the known “reqinput” value, new password, confirm password and password strength parameters. BANG!! He successfully able to reset our eBay account password without our team member’s interaction within a while. 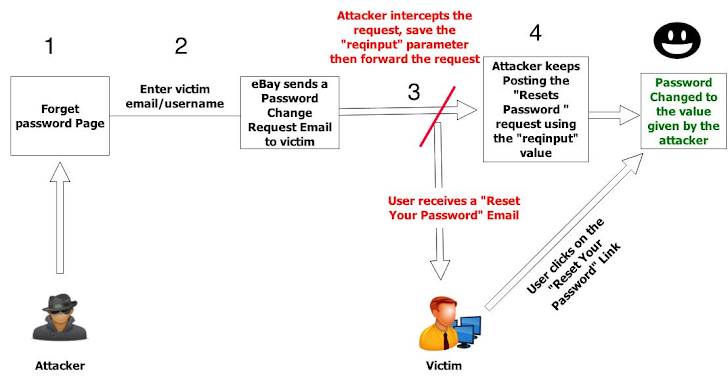 A sophisticated hacker could had launched an automated mass password reset request attack for all those email accounts which were leaked in previously reported massive eBay data breach. The company has already patched the vulnerability after Yasser responsibly disclosed the flaw to the eBay security team. But, this 4 months delay in delivering the patch could have compromised millions of eBay users’ accounts in a targeted attack, even if you had changed your password after the data breach.